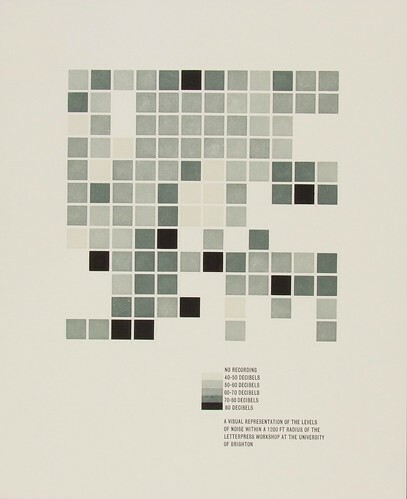 Initiated by Alexander Cooper (London College of Communication, UAL) and Rose Gridneff and Andrew Haslam (Brighton University), 6x6 includes six colleges with active letterpress workshops: University of Brighton, Camberwell College of Arts, London College of Communication, Central Saint Martins, Lincoln School of Art & Design and Glasgow School of Art. Practitioners involved include letterpress technicians, design lecturers and students. 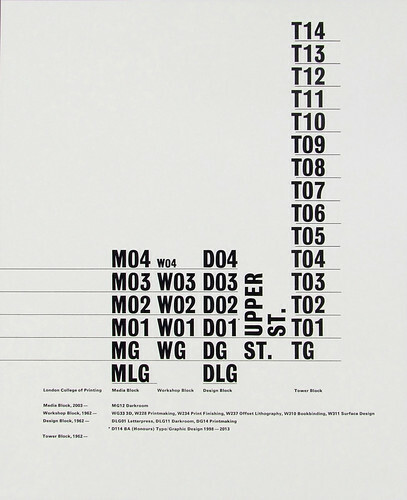 A typographic diagram of London College of Communication, formerly London College of Printing, by Alexander Cooper. Top: print by Phil Baines. 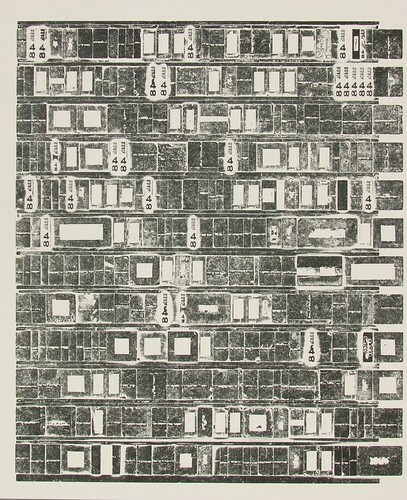 The work on show at Her House included impeccable examples of letterpress as a medium for direct communication and playful, emotive decoration. The work will be published later this year as a limited-edition book, alongside essays from all six contributing institutions. Yet at the project’s core is an uncomfortable truth and one that Gridneff, Cooper and Haslam deserve credit for confronting. The print industry’s decline was accompanied by an institutional abandonment of core skills: compositors are members of an endangered species. 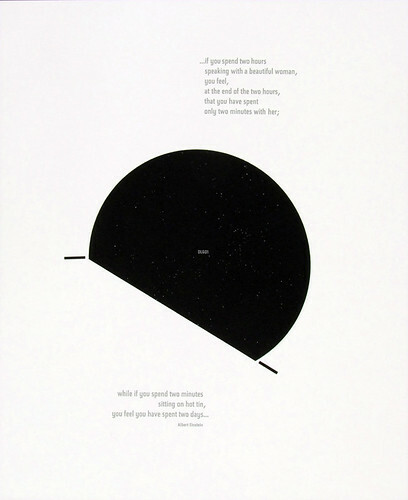 Letterpress piece by Brighton University student Barnaby Stepney. The conference ‘Something to Say’ (see Catherine Dixon’s pre-conference overview and Stephen Barrett’s review ‘Lay-out - speak out’ on the Eye blog) at St Bride Library aimed to present letterpress as ‘more than retro-nostalgia’, but many of its examples were rooted in the ghetto of radical or community politics. Another cause for concern in terms of practice is the fashionable ‘letterpress aesthetic’, which offers the worst kind of letterpress stereotype: a bastardised affront of under and over-inking, worn-down type and the mixing and (mis)matching of typefaces in the same word. What would have ended up in the bin is too often celebrated as ‘authentic’ and ‘hand-made’. Yet the history of letterpress practice is full of work of exceptionally high standards that spoke of craft honed over a professional lifetime. The desire for letterpress to break out of its niche market, may ultimately be unnecessary. If letterpress is to ‘pay its way’ in our new media world, might education prove to be its saviour? 6x6 print by London College of Communication student Arianna Tilche. The education of the modern graphic designer – if mass communication is to remain its primary goal – needs typography at its core. Design education should illuminate the universal over the particular. Instead of chasing the latest technologies – that will likely be redundant by graduation – educators need to invest in timeless design applications and approaches. 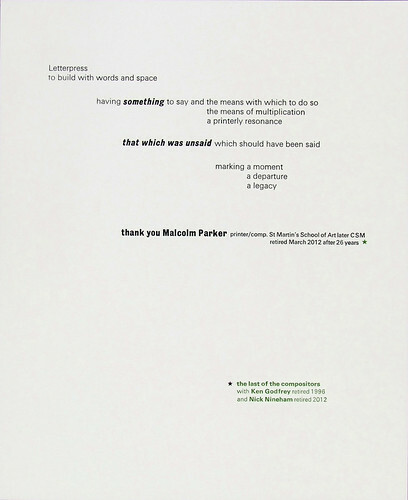 A print by Catherine Dixon, giving thanks to Malcolm Parker, the last Central Saint Martins compositor to retire. Letterpress provides skills that are both transferable and future-proof. It provides the kind of immersive approach that students need. Teaching letterpress as a core part of design education would equip students for future challenges, because of its place in history and what it tells us about design fundamentals – type form (formal attributes), the visualisation of ideas, proportionality, colour, tone, balance, symmetry and so on. 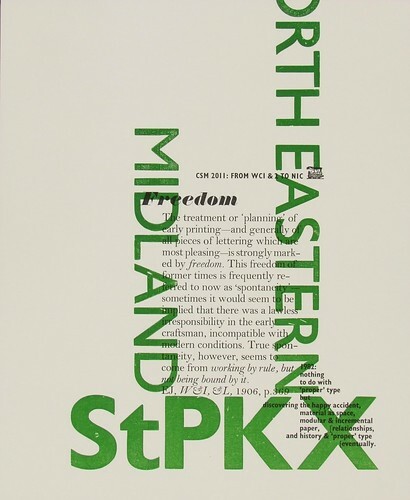 The 6x6 project is adventurous in its aims to highlight and document letterpress resources in education. But what it implies for the education of the contemporary graphic designer deserves our attention. 6x6 print by Glasgow School of Art student Ross Hogg.